Apple shared its latest data on iOS 8 adoption on Wednesday, showing that 68 percent of iPhones, iPads, and iPod touches are currently running the latest version of Apple’s mobile operating system. Apple tracks iOS adoption by looking devices that access the App Store, and marking which version of iOS is running on each of those devices. The latest App Store Distribution data was collected on January 5. Besides iOS 8 data, it shows that 29 percent of devices are still running iOS 7, and 4 percent are still clutching to iOS 6 or earlier for dear life. 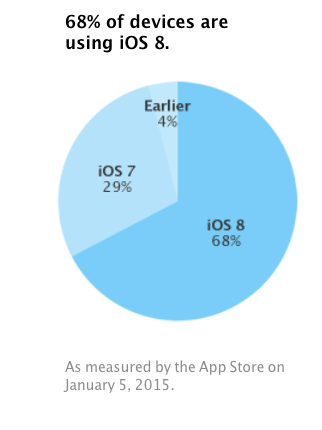 Apple’s last iOS adoption data was from November 2014, which showed 60 percent of devices had upgraded to iOS 8. An 8 percent uptick in two months time is pretty slow, especially considering the sales boost that Apple must have seen during the holiday season. We’ve noted before that iOS 8 has had a particularly rough time getting off the ground compared to older versions of iOS. iOS 8 saw sky-high installs when it first launched—it hit 46 percent of devices just six days after it launched back in September 2014—but then downloads steadily tapered off. By comparison, iOS 7 hit 74 percent of devices just three months after launch, and it quickly became Apple’s fastest growing mobile operating system. iOS 8 lost that race. Or, it could be the massive size of the install itself: it’s about 740MB on the iPhone, and 1.03GB on the iPad. That’s enough of a space hog to cause some 16GB iPhone owners to actually sue Apple over the constraints. Are any of your iOS devices running iOS 7, or even older? Let us know in the comments below. Leah Yamshon has been a part of the Macworld family since 2011. She started out covering iOS accessories (So. Many. Cases.) and Mac software, then moved on to all things iOS. She now works behind-the-scenes to keep Macworld's calendar full.